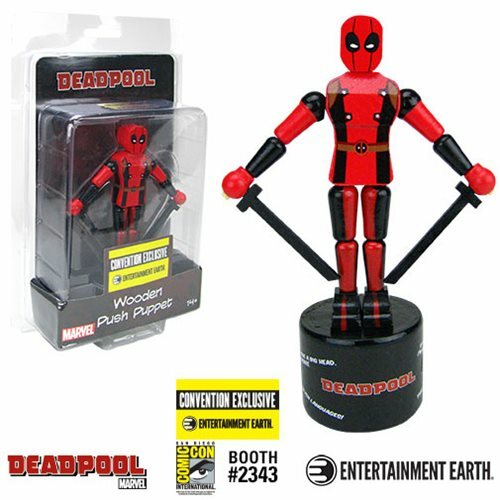 Enjoy Deadpool as an individually numbered limited edition push puppet! Push the hidden button on the bottom to see the Merc with a Mouth move! Base includes phrases that only Deadpool can pull off and say! When classic, retro-styled toys collide with iconic, beloved Marvel characters, everyone wins - especially when it's an Entertainment Earth Convention Exclusive! Thanks to the clever designers at Entertainment Earth, you can enjoy Deadpool as this 5-inch scale floppy wooden puppet that collapses, moves, and stands up again when you push the hidden button on the bottom of the base! Created from solid wood, this Deadpool Wood Push Puppet features vivid hand-painted artwork, along with some decal elements. Cute and fun as can be, the wisecracking crime fighter is designed in a vintage style reminiscent of traditional push puppets known as Wakouwa. Each Entertainment Earth Convention Exclusive is individually numbered with the production run number on a holographic sticker - only 492 figures produced! “I've been besmirched! This besmirchment will not stand!"